Homs, SANA- Two cultural events to be held in the ancient city of Palmyra on the occasions of Martyrs’ Day in Syria and the Victory Day in Russia. 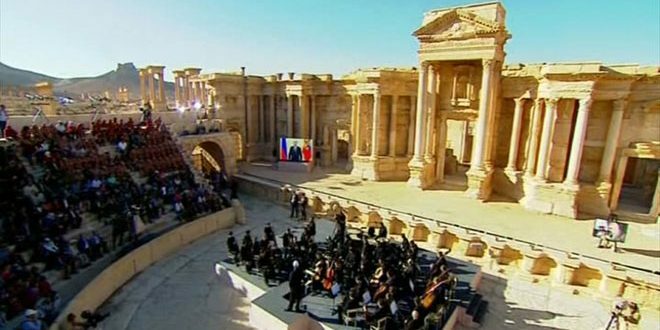 The first event has started amid large popular turnout through the concert of the Symphony Orchestra of St Petersburg’s Mariinsky Theater, headed by Maestro Valery Gergiev at Palmyra’s Roman Theater. “This celebration is a sign of gratitude, memory and hope – a gratitude to all those who fight terrorism and sacrifice their lives; a memory for all victims of terror regardless of the place and time of crimes committed against humanity; and, of course, a hope to rescue the modern civilization from this terrible plague-the international terrorism,” President Putin said. He affirmed that any success in fighting against terrorism should be evaluated as a joint victory by everyone, without exception, and then triumph over terror would be possible. 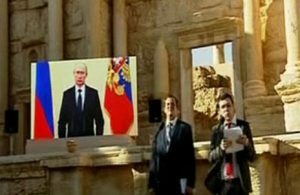 For his part, Russian culture Minister Vladimir Medinsky said “We are against all crimes perpetrated by terrorists in Syria,” considering this event and the restoration of art to historical theater of Palmyra as a message to the whole world that terrorism has no religion or roots. 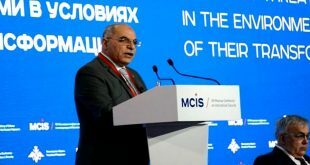 Syrian renowned director Najdat Anzour said “The Syrians, in cooperation with the Russians, have been able to liberate Palmyra and restore brilliance to its ancient theater,” hoping all Syria would be purified from terrorism. The event will be held at Palmyra’s Roman Theater with the participation of Syrian National Symphony Orchestra, Syrian National Orchestra for Arab Music, Orchestra Mary and al-Farah Choir.